We leave Sydney on a wet, overcast day. Our destination is the Red Center of Australia, otherwise known as the Outback. We fly over dry, desolate land. Scattered scrubby trees and bushes weave a haphazard pattern through red dirt, broken only by a singular strip of paved road. I’m startled by the all-consuming redness of the landscape. Our plane touches down on a runway carved out of the red dirt at Uluru. This is actually a semi-arid desert area because splotches of brown grass, small shrubs, and thin, sparse trees surround the small airport. Our bus takes the lone asphalt road to Ayers Resort. This is how we get to see Ayers Rock, one of the goals of our Australia trip. The Resort is a real oasis. It includes a range of accommodations in five hotels, medical facilities, restaurants, Visitor Center, and a tiny shopping center--all in a circular complex easily reached on foot or by shuttle. Our hotel is called Sails in the Desert, aptly named because many sail-shaped awnings shade the property, both in front and back. We check in and head to the shopping center for a sandwich at the Red Rock Deli. At the Visitor Center we explore exhibits telling about the harsh environment, the animals that survive here, and the importance of the little rainfall that is received (about 12 inches a year). We walk to a look-out point, scuffling feet through dense red sand. We find another trail on our way back to the hotel and walk through scratchy brush to a vantage point that offers broad views of the surrounding landscape. We’re on the lookout for geckos, rabbits, and snakes, but it’s early afternoon and too hot for these creatures to be roaming about. 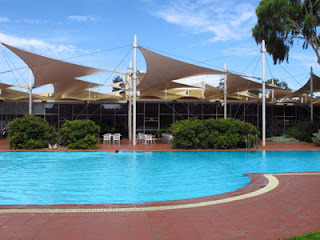 We decide the perfect place to cool off is at the hotel’s pool. 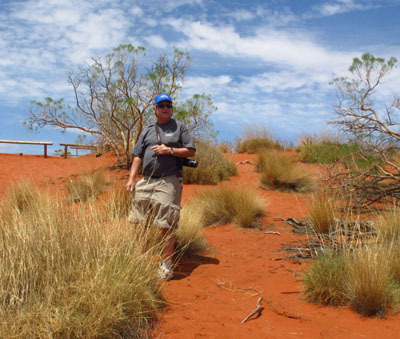 In the evening we take the Sounds of Silence excursion to watch sunset fall on Ayers Rock followed by a three-course dinner on white-clothed tables in the middle of nowhere. It’s cloudy, but white streaks in a blue sky form a pretty background for streaming sun rays. We sip wine and snack on canapés of kangaroo meat, smoked salmon, and pastries while waiting for a magic moment that never comes. Don’t get me wrong: Although Ayers Rock isn’t gleaming the fire-red depicted in many pictures, just being in this isolated place, looking out over lands of extreme cultural significance to local Aborigines and absorbing mystic feelings associated with the Rock is a humbling and fascinating experience. 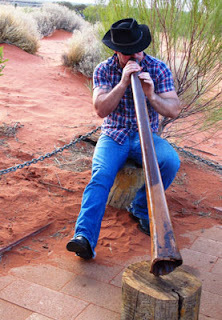 Meanwhile, we listen to a musician play the traditional didgeridoo, a long pipe-like instrument from which drifts an awkward melody that resembles a frog croaking. Later, he plays songs in a near-monotone that's surprisingly soothing. After sunset, which cast an ominous glow over the Olga Mountains in the background, we walk to the remote dining area. Darkness settles, so we feast by candlelight. Still, after filling our plates with salads, vegetables, kangaroo, barramundi, fish, lamb, cream cheese brownies, and carrot cake, the sparse light really doesn’t help us identify what we’re eating. We stuff forkfuls of tasty food into our mouths and try to savor the different flavors. Clouds completely block the stars—usually a spectacular feature of this excursion. A clear sky would have been filled with millions of twinkling stars, but tonight, instead of an astrology lesson, we hear a native Aborigine story of how the Milky Way got into the sky. 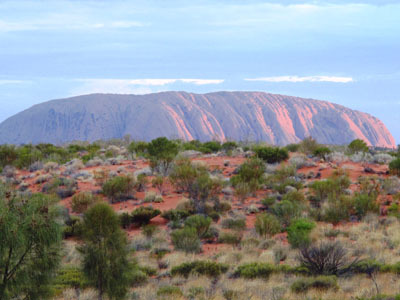 I look forward to the next day when we get up close and personal with Ayers Rock. I have just returned from the Kimberley, witnessed a sunset and sunrise over Uluru (Ayers Rock) and Kata Tjuta. This is one of my amazing experiences.